I was particularly shocked many years ago when a woman friend, who was not that conservative, commented that she loved men in uniform. Any uniform. I have learned that there is an element of appeal for many women even with police officers. There is an element of authority and masculinity in the design and wear of men's uniforms. 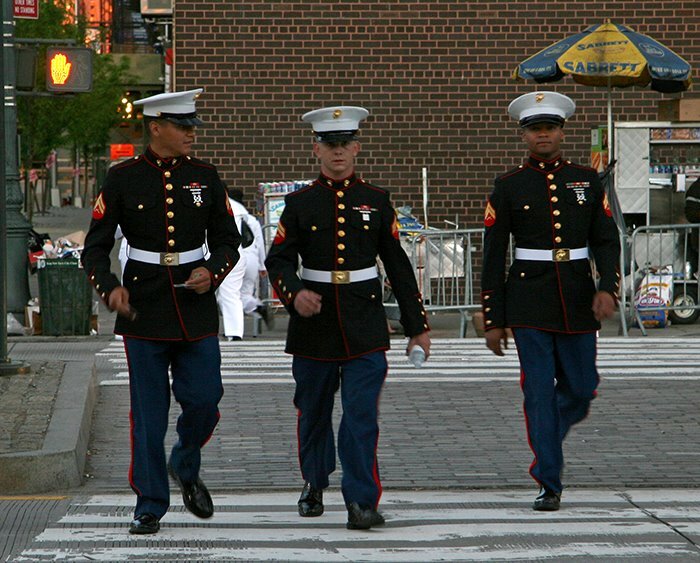 The appeal of men in uniform always passes through my mind whenever I see officers/sailors like these three gentlemen who were headed back to the Kearsarge battleship which is docked in NYC harbor as part of Fleet Week. Sailors could be seen throughout the city in the last few days, but unsuccessful in getting the photo I wanted, I found myself making a pilgrimage uptown to the west side piers (the location of the ships), where certainly I would find the men I was looking for. And there were thousands, coming and going to the Times Square area - just a short stroll from their berth at West 48th Street. Some attribute the cache of men in uniform to have been significantly enhanced by the film Officer and a Gentleman starring Richard Gere. The title of the film uses a phrase from the U.S. Uniform Code of Military Justice which makes reference to being charged with "conduct unbecoming an officer and a gentleman."